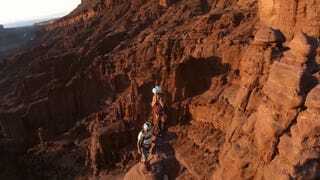 Watch Hayley Ashburn and Marshall Miller climbing the Ancient Art sandstone formation in the Fishers Towers, near Moab, Utah, through the "eyes" of a GoPro Hero3+ camera. Then hold tight to your seat as they prepare themselves and jump. A general view of the towers.